In 1850, Great Northern Railways finished a single track rail link from Kings Cross to York. Subsequently, goods lines were added and by 1878, the coal depot sidings were laid in the Highbury area. The area which is Gillespie Park now was a railway siding, exclusively used for sorting coal. In 1892, to the east of the sidings, H.C. ‘Inky’ Stevens opened an ink factory. Designed by his son, Michael, and built in the form of a Venetion palazzo, it produced ink, office utensils, carbon papers and gum - the raw materials being delivered by rail from London Docks. It was closed in the 1960’s and a council estate built on the site in 1972. The sidings ceased to be used when the factory closed. In 1980, the idea for a park on the area was put forward by interested local groups. There was a conflict between an environmental group, who wanted to keep the park closed and left to grow wild, and Islington Council and others, mainly Gillespie Road residents, who saw a closed park as a security risk. Hence, the buffer zone between their gardens and the park. Also at this time, Arsenal Football Club, whose stadium is across the road, wanted to acquire the land for car-parking use. By 1981, a ten year lease from British Rail was secured by the Recreational Services Department of Islington Council. The Council insisted that it be kept open. Landscape work was carried out over three acres of the site - mounding to create an undulating effect and the construction of a pond, although large areas of the park were left untouched and original vegetation left intact. There is an interesting contrast between the managed and unmanaged land. Planting of a variety of trees and shrubs and wildflower seeds followed. An area to the north was supplied with topsoil (the whole area was covered with coal dust, fire ash and broken brick) and given over to local people as allotments. Before the expiry of the ten year lease, there was pressure from central Government and the Department of the Environment under N. Ridley, to sell as much public land as possible to generate as much capital as possible. British Rail was pressurised to sell the land to the highest bidder. When the future of the park was in jeopardy, local people got together along with the support of the local councillor to form a pressure group to keep the park open. All the local political groups were invited to join the campaign in 1987 - the local branch of the Tory party were the only group who refused. The campaign committee consisted of 15 people. Regular meetings were held with the local community, although the people who ran the allotments were not involved with the campaign at the beginning. There was strong pressure from the Leader of Islington Council (Margaret Hodge) to favour the use of the park site for housing. Since the Council owned the entrance to the proposed development, in St Thomas's Road, this gave them weight to negotiate in support of the park. The campaign received a lot of national and local publicity. British Rail agreed the sale of the freehold to the Council for use as parkland (the site being valued at approx. 8-10 million for the total ten acre site) on condition that agreement be reached on the siting of a building development providing homes on behalf of New Islington and Hackney, Islington and Shoreditch and Ujima Housing Associations. In return, half an acre was retained for allotment use and the park gained a two acre extension between the park and the railway line. Also, the builders would agree to fund the extension of a Parkland Walk which runs from Highgate to Finsbury Park to Gillespie Park. There is, however, some local opposition today, to the extension of Parkland Walk and there is a move to close the area of the walk near Finsbury Park which is causing some problems. The extra area obtained by the development deal supports a rich grassland habitat including Islington's only orchid, a common spotted orchid, discovered in 1991. Unfortunately, adjacent to the new land is a further area of the original coal depot which also supports rare species of grass which was obtained by Arsenal Football Club in 1994 for a development and parking area against the desires of local environmental groups because: birch trees and grasslands with wildflowers would be lost and the earth covered in concrete; and, the area forms a valuable wildlife habitat and corridor for birds, hedgehogs, butterflies and foxes who visit or live in Gillespie Park. As already stated, Islington is deprived of green space which is especially important in an area which is surrounded on all sides by main arterial roads and which has very high pollution levels. One of the conditions of granting permission for the development of the park by the Council was the building of an Ecology Centre on the site. 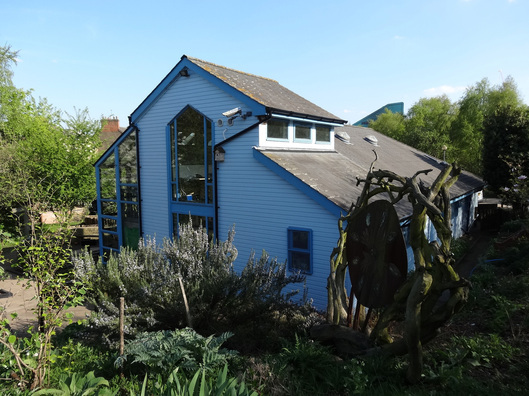 In 1992, Urban Programme Funding was agreed to build an Ecology Centre to act as a teaching centre for schools and information centre for the general public. The building was designed to be as environmentally-friendly as possible. Gillespie Park is about the size of 4 Arsenal football pitches. These features include: softwood from sustainable sources; solar panels; and, organic paints. The design group for the Ecology Centre included local people, council architects and environmental groups. The Centre has won many awards. Gillespie Park is supported by a group formed three years ago out of the campaign group called 'Friends of Gillespie Park' and the Ecology Centre Manager. It has ten elected members every year and its aims are to protect and promote the park for the benefit of the local community. A festival is held every year featuring many multi-cultural events and it is fast becoming a focal point for the community.The pond is home to tiny water creatures, bugs, frogs, toads and newts. All together, 80 species of birds, 20 species of butterflies, 8 species of dragonflies, and 200 flowering plants have been recorded so far. Grasslands on the sidings have been declared of metropolitan significance by the London Ecology Unit, and a rare lichen - Peltigera Didactyla has also been found. The significance of the park is, therefore, undeniable. Trevor Wood. Breathing Space: The Revitalisation of Post-Industrial Landscape. References include Islington Ecology Centre Interview with ex-Islington Councillor Diane Burridge, ex-chair of Council's Environmental Group and a member of the Friends of Gillespie Park in June 1996. Of course, we can't remember our conception, into this vast cosmic womb, that is perhaps like a beautiful pond surrounded by a paradise park. Yet, as days pass, more our imagination sees that with a big bang we were conceived, along with countless young atom siblings that develop into life. We huddle together into groups, like penguins keeping warm, to become the bright Light of the fiery stars within this watery cavern of wintery darkness. As we gestate we grow, and leave the homely glow of our embrace, like smoke leaving a chimney, only to cuddle up again, into earthly spheres, near to the stars. Where earth grows limbs of rivers, oceans and trees, and limbs of birds and bees, and limbs of creatures like elephants, bears and human beings. Fourteen billion years after my conception, I metamorphosed like a caterpillar, into a human being and was born from mother's womb, at Whittington Hospital. I then lived in a bedsit with my family in Hazellville Road and then later in Wheelwright Street next to Pentonville Prison and finally in St. Thomas's Road. Into the wild pool, of fragrant, lush meadow. At last, I was in paradise on earth. At the end of the garden was a towering wall of shimmering, dark green ivy. Through the back fence, we glimpsed through gaps the wonder of the abandoned railway sidings we imagined no human had discovered before. Years passed, we grew tall enough to climb the living wall, and we saw a sea of multi-headed purple lupins, together lovingly chattering, in the summer breeze. We plunged below, dwarfed by the many-headed purple people, greeting us with great love. Beneath dwelled steel snakes, long as the world, called railway tracks. Mountain ranges of prickly bushes, full of sweets called blackberries. We picked them for mother, she made into pies, jams, black milk; we ate, drank all summer. At thirteen I started my Saturday and Summer holiday job on Holloway Road, Depriving me of heaven, which was later named Gillespie Ecology Park. When at last I'm born from this celestial pond, into its surrounding Garden Paradise, I hope our true Heavenly home is twice as nice as Gillespie Park. The Friends of Gillespie Park Committee meets from time to time and has its AGM in the spring, when you can enjoy a guest speaker and have a glass of wine. If you would like to be a member of the Friends of Gillespie Park please get in touch. Either use the form or email - details on the contact page. Please go to our new Archive Sectionto view past content.